It’s been nearly a year and a half since Malaysia Airlines Flight 370 disappeared and investigators finally have their first big lead in the search. 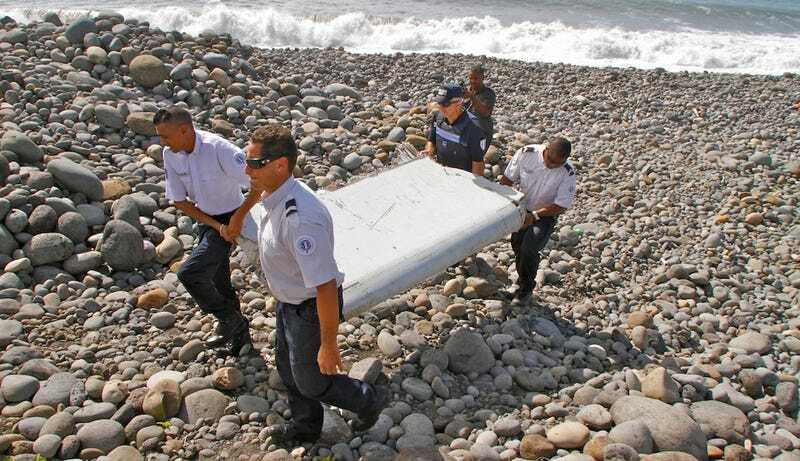 A piece of an aircraft’s wing—a flaperon, to be specific—washed up on Réunion Island, east of Madagascar, some 3000 miles away from where investigators were looking. But we’re still a long way from many of the answers we need. So far, there are some encouraging signs which indicate that this might be actual wreckage from the plane. Specifically, the flaperon, which is a movable part of the wing, appears to come from the right kind of plane: A Boeing 777. No other 777 has ever crashed in the ocean before so it couldn’t be from any other plane—in theory anyway. Investigators are being very cautious in analyzing the flaperon. It’s been in the ocean a long time, and frankly, it’s just so unlikely that it could’ve ended up on a far-flung island that they need to be sure. A report from the Wall Street Journal says investigators are under intense pressure to confirm that the debris is from MH370, and that’s not surprising. Mourning families want closure for the loss of their loved ones, and airline officials and safety experts want to make sure this never happens again. But the journey to identify the part has just begun, and it could take a lot of time to confirm if it’s really the elusive lead everyone craves. Investigators don’t want to make a mistake. Could the flaperon have possibly traveled that far? Réunion Island is about as remote as an island can be. The tiny French outpost is 500 miles off the southeast coast of Madagascar—pretty much on the opposite end of the Indian Ocean from where investigators were officially searching. So assuming this flaperon really is part of MH370, why was discovered so far from where investigators were looking? Let’s back up for a second here. Last year, after focusing on one section of the southern Indian Ocean, Australia and the US’s transportation safety boards outsourced the official search to Fugro, an oil and gas exploration company from the Netherlands. The search effort was plagued by delays, owing to the technical difficulty of searching for a plane-shaped needle in a deep ocean haystack; the company had to purchase a new deep-sea sonar to help it map the bottom of the three-mile-deep ocean. Additional ships added a sonar device called a towfish that’s towed at depth of 100 meters above the seafloor, and a self-propelled autonomous underwater vehicle (AUV) which can travel even deeper did some hunting, too. The search has been heavily criticized for being mismanaged, and for the most part, we haven’t heard many updates. The physical search hasn’t turned anything up. As the quiet physical search floundered, public entities used math and science to try to sort out the possibilities themselves. An excellent story about the search by Christine Negroni pinpoints the work of a British satellite company called Inmarsat at the center of an energetic crowdsourced effort. While the physical search was private in most of its findings, Inmarsat has made details of their own data-driven search public, encouraging an ongoing crowdsourced effort to consider more places where the plane’s parts might make landfall. Of particular interest was the analysis of mathematicians using a probability theorem called Bayes’ Rule. The theorem analyzes the degree to which new information—like data about weather and ocean currents—can change the outcomes of statistical models. It has been used to help find other lost planes in the past. Inmarsat’s theory was that the plane tracked much further west over the southern Indian Ocean than investigators originally thought, and the crowdsourced info seemed to suggest it was possible, too. In other words, according to lots and lots of unofficial nerds, the discovered flaperon could be the real deal. How will they know it’s from MH370? After all that searching, the notion that part of the lost plane washed up on an island seems like incalculable luck. The next part of the mystery seems outrageously simple by comparison, as there’s really only one question investigators need to answer: Is this a part from a Boeing 777? That’s because there’s never been one 777 lost over the ocean before: MH370. There are already some promising signs. The 777 flaperon, which, again, is a moveable part from the back of the wing, has a particular shape that’s unique to all Boeing’s other flaperons, so a simple comparison of the dimensions suggests that it’s from a 777. But remember that the part has been tossed in the ocean for a year and a half. A quick eyeball is not enough. There also is a seal on the top of the part that “is consistent with what I would see on an inside flap on a triple 7,” he said, and the barnacles on the part are consistent with the “parasitic activity” that would take place from being underwater so long. However, the part appears to be coated in white paint, which would run counter to Soucie’s other observations in that the 777’s parts would be coated in zinc chromate, not paint. Soucie acknowledged, however, that the part could be coated in something from the ocean. Looking closer, investigators will hunt for serial numbers inscribed into the flaperon’s parts, much like the individual numbers printed on gadgets. These would confirm not only which type of plane the flaperon is from, but also the exact aircraft it was made for. Finding digits might be wishful thinking, though, as oxidation from 500 days at sea might have erased the numbers. Wired reported that another aircraft security expert, Xavier Tytelman, claimed to make an undeniable match based on the shape and he also says he found what he thinks is part of a serial number: “BB670.” Sure, maybe? “Immersion in the sea and the temperature of the water definitely can have some impact” on the condition of debris, according to Robert MacIntosh, the former top international official at the U.S. National Transportation Safety Board. Oxidation or corrosion can occur depending on the type of aluminum alloy, he said, though metallurgists would know how to deal with such conditions. The Malaysian government dispatched a team to Réunion Island to examine the flaperon as well as other debris found in the area. The piece is now being sent to an aeronautical technology center in Toulouse, France that handles aircraft crash investigations. It was flown out this Friday morning. To add to the confusion, a twist: There was also a report that a suitcase found near where the flaperon washed up on shore. It’s a fishy footnote compared to a huge hunk of plane, but it still offers investigators and families desperate for closure another (immensely improbable) reason to hope that more parts might be discovered, and that the plane’s fate might finally be confirmed. Even if this part ends up being MH370, there’s still so much we need to know. Why did the plane go down? What happened to the 239 people on board? Let’s hope this tiny clue begins a large-scale recovery effort that might start to reveal the story, piece by weathered piece.